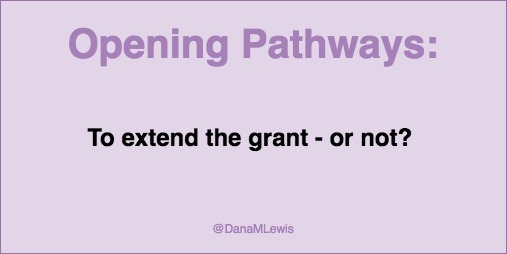 To extend (the grant) or not extend? Heh. Did you read my lessons learned post about paperwork and all that time and energy it took? Well, we are about one year into the grant. One of my upcoming tasks will be to write a summary for RWJF about the grant. But one of the things I’ve also been doing, in addition to reflecting on the work so far, is also planning ahead and assessing our timeline for the rest of our work. And one thing I’ve been debating is whether to ask for a grant time extension. It’s something I’ve been calling a “calendar” extension, but I think the formal term is “no-cost” extension. This is where you add more time to the grant; there may or may not be budget moved around within the grant (the grant funder isn’t providing more money). There are some benefits to this – but also some potential downsides that I wanted to highlight. I’ve been struggling with this decision, and our grant officer (smartly) suggested I pose the question to the community about what would be best to do. Even if there’s not much feedback on this topic, I (obviously) find it a helpful exercise to document these meta-decisions about how we do the grant as we go. One of the obvious benefits to a calendar extension is more time to do the work. I don’t necessarily need more time for us to do the work. However, I do see the benefit in having more time to engage in discussions around the processes and output of our work. Normally, PI’s have lined up other grants and also have salary, so there’s no shortage of opportunities (or funding ideally) that allow them to continue to build upon their work and talk about it, even once a particular project is “done”. In my situation, of course, it’s different. Having more time at the end of the grant to bring this work to the world would be a positive. One reason this is also positive is the “air cover” or “social credibility” (or perhaps ‘professional credibility’) that the grant time period provides. Extending that enables more time where I am “PI”. I’ve seen a marked difference in how people treat me at scientific conferences – unfortunately – as a result of being PI. I dislike that it takes a title and a role in the traditional framework for people to take patients and their work seriously. However, it is a benefit that’s worth analyzing and balancing with everything else. (It’s also a downside – more on that below). I was originally thinking that this no-cost extension would actually cost me money, as I was slated to be paid for my work for the 18 months; but doing more work into the 24 month time frame would be unpaid. That was going to be a decision I would have to make. However, I was also told there is the opportunity to re-evaluate the budget at the same time you make the extension proposal; and if we had unused budget from other areas and our team agreed; we could propose providing some funding for my time for those additional months. I have not talked about this with my team yet, or re-evaluated our budget for that purpose yet, but for 100% transparency that is a possibility. Along with budget re-evaluation, we could also do more data science work if there continues to be demand/interest from the community in this. I was originally expecting this to wind down over the course of the grant; but based on what we’ve learned, I’m interested in inviting more members of the community who want to do research to partner with us, because each and every project we’ve done is such a valuable learning experience. Summary of potential benefits: more time to do the work; more time to share the work with the world; more air cover; potentially additional months of funding (although likely at an even lower rate than I am currently covered, which is about 40%). I brought up the question of an extension because I wasn’t sure what it entailed and what the pros and cons were, and especially in our situation. However, I had an uncomfortable feeling when I discussed it. I think it has to do with privilege: I feel very privileged in my work on this grant. I am and was in a position of privilege to be able to get to the point to be to take on this work. I am in a position of further privilege to be able to evaluate whether to do the work unpaid for an extra 6 months. I am very cognizant that most people would not be in this position. And I feel like many of the benefits of extending the grant timeframe will be direct or indirect benefits to me. Now of course – this work is work that I am trying to do to help people in both the short term and long term. But still, I want to acknowledge my privilege and the feelings I have, because I think it’s valuable feedback and a reminder of why I am doing this. Another obvious downside is that of opportunity cost; if I am still working on this project, I may not see or have time to take advantage of other opportunities (which would include potential full-time traditional work). I may also distract the rest of my team from taking what they’ve learned and more quickly applying it to other grants and projects where they can have an amazing ripple effect elsewhere. Summary of potential downsides: this reinforces my existing privilege in this position (and regardless of extension or not, I continue to analyze what more I can do to help others as a result of this); and opportunity costs for me and the rest of our team. I think for the most part, most people in this position (from the feedback I’ve asked for so far) would take the extension. However, I would like to ask the question publicly: what would you do in my position, if you had more work that you wanted to do on a grant? And regardless of what you would do, what ways do you think we could work to make the system better for people who are not in positions of privilege (aka PI’s like me & others)?